Google Sheets or Microsoft Excel Digital Magic Reveal Pixel Art - students solve multiplication or division problems to AUTO-GENERATE pixel art images in Google™ Sheets (or Microsoft Excel™). These self-checking, EDITABLE, digital activities work with ANY device with Google™ Sheets (iPads, Chromebooks, and more) and include differentiated versions. Easily integrate Google Classroom or Google Drive™ online storage service into your April, Spring, or all year plans with this low prep, paperless, BUNDLE! 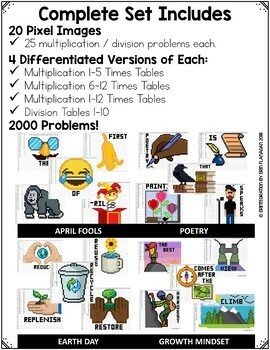 This listing is for the BUNDLE of April Digital Reveal Pixel Art packets and will include a total of 4 sets, 20 images, and 2000 multiplication / division problems to choose from. This bundle also includes a free supplement that shows you how to edit the formulas to use TEXT answers. With this supplement, you can now edit the questions & answers for any subject to create quizzes, short answer questions, true/false, exit tickets and MORE! What is Digital Magic Reveal Pixel Art? As students solve the problems in Column A, by typing their answers in Column B, a mystery pixel art image is revealed, piece by piece. 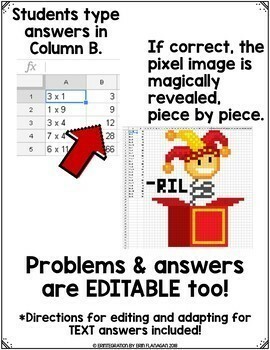 Students will know they have typed the correct answer if they see pixels appearing! If nothing happens, then students know to self-correct their answer. Students do NOT need to be familiar with Google Sheets to do this activity. 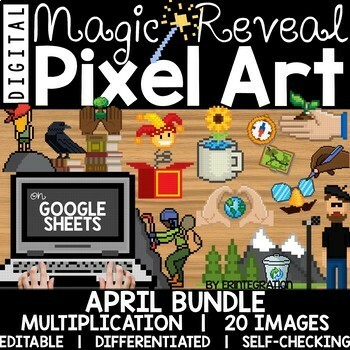 ★ Digital Magic Reveal Pixel Art templates - 5 magic reveal pixel images PER SET are created in your choice of 4 differentiated Google Sheet versions! Each image is revealed by solving 25 multiplication problems. (For a total of 500 different problems in each set). ★ Need to differentiate further? PDFs include 2 pages of visual directions for EDITING both the problems and the solutions on Google Sheets and Microsoft Excel! Please note, the pixel images cannot be edited. 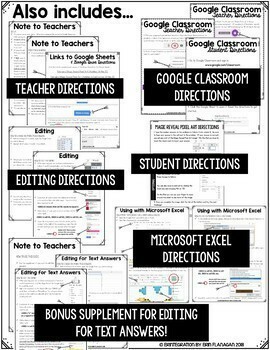 ★ Teacher & student directions for setting up, downloading and sharing Google Sheets with students using either Google Drive or Google Classroom. ★ Optional Student page of directions for using Google Sheets. ★ This activity is compatible with Microsoft Excel. PDFs include directions for downloading as an Excel file and editing in Excel too! You and your students will need Google Drive accounts either individual or a shared account or access to Microsoft Excel. This game works great with and without Google Classroom and can be used whole group or in a center. Google and Google Apps are trademarks of Google Inc. © 2015 Google Inc. All rights reserved. Microsoft Excel is a trademark of Microsoft. Erintegration is not affiliated with and has not been authorized, sponsored, or otherwise approved by Google Inc. or Microsoft. By purchasing this resource, you agree not to create derivative resources for commercial sale or for free distribution beyond a single classroom using the formulas and pixel art images provided by Erintegration.